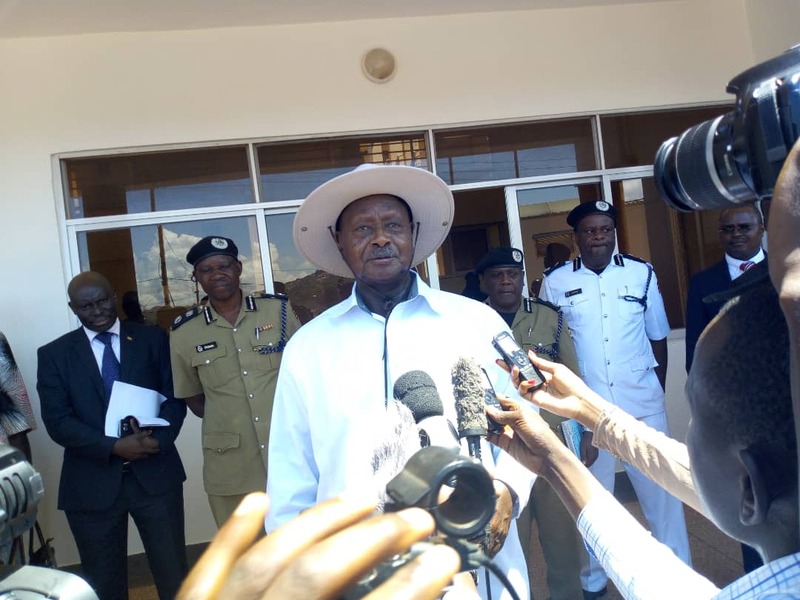 KYOTERA – President Museveni has said his government has the capacity and experience to solve the security concerns that are currently afflicting the country. Speaking at celebrations to mark 56 years of Uganda’s Independence in Kyotera District, Greater Masaka, on Tuesday, the President reiterated that of the challenges he has encountered, security is not among them. “I need to apologise for coming late; I was, however, doing some good job in Kampala of installing CCTV cameras. We are going to roll out the same programme along highways and the whole country,” he said in reference to the Command and Control Centre he commissioned in Nateete, Kampala, that will control the first batch of CCTV cameras installed in Lubaga Division. He also mocked terrorists whom he said think they can weak his government by attacking important personalities in urban areas. “I can assure you that all the problems I have handled in the last 55 years are bigger than terrorism. I will defeat the terrorists too,” the President added. Mr Museveni reiterated his call to farmers to abandon substance farming and adopt commercial agriculture. He expressed disappointment that the agriculture sector was growing at a slow pace of 3.2 percent compared to 7.9 percent of ICT, services (7.3 percent) and industry (6.2 percent). “The bigger problem we still have is the mindset change. Our people cannot benefit anything from agriculture when they are still farming for subsistence purposes. Leaders here need to take it upon themselves to sensitize people to understand commercial agriculture to guarantee food and household income,” he said. He said this financial year, government will roll out a number of irrigation projects in at least 14 districts. “There are a number of irrigation projects we are going to launch soon and these projects will enhance our efforts in agriculture,” he said. Mr Museveni used the same occasion to promise a ferry connecting Kyebe sub-county to Nangoma Island on River Kagera. Unlike previous independence anniversary celebrations, no president from African countries attended this year’s event. There was a parade of the armed forces and procession of various institutions that showcased their goods and services. This year’s independence anniversary was marked under the theme “Standing tall to celebrate 56 years of independence”. Over 80 Ugandans were awarded medals in recognition of their illustrious contribution to the transformation of the country.